Margarita is located in the Satevó Municipality in Chihuahua state, approximately 120km SW of the state capital of Chihuahua City, and 110km NNW of the historic Parral Mining district. The property has year round unrestricted access provided by a good network of Federal-State highways and well maintained dirt & ranch roads. 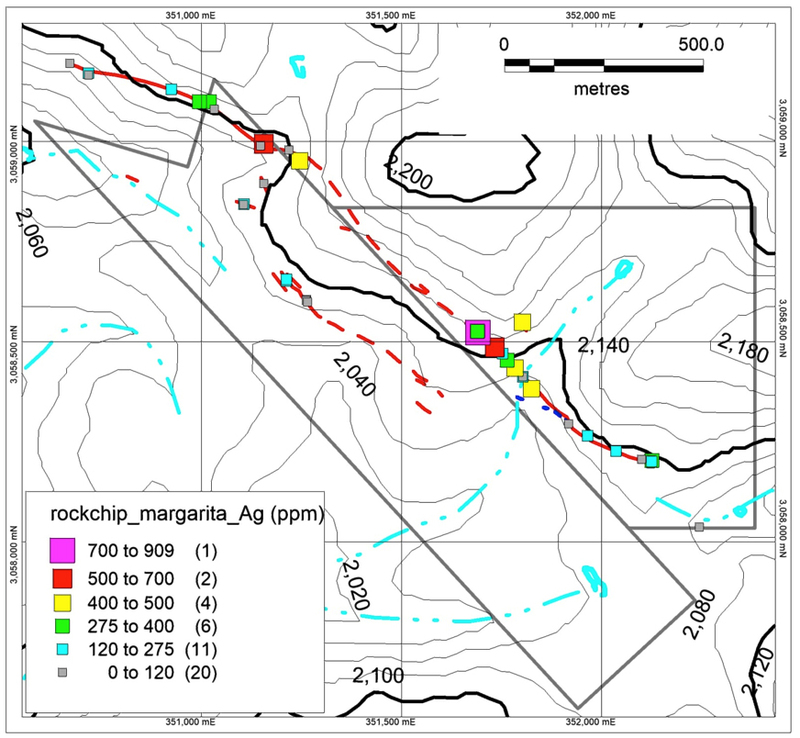 Mineralization on the Margarita Property is hosted in a series of parallel, steeply dipping, northwest-trending veins, some of them known for ~1.8 km along strike. The veins show classical banded epithermal quartz textures with an apparent thickness of between 1 and 5m. The Margarita-El Tren and El Caido veins are the main exploration targets in the property. They are separated by 150-200m and can be traced along strike on surface for at least 1.8km and 500m respectively. Several other additional veins have been identified in outcrop although the strike extent is currently unknown. Margarita-El Tren vein structure dips to the SW while El Caido vein structure dips to the NE. Both veins have steep dips ranging from 60°-76°. 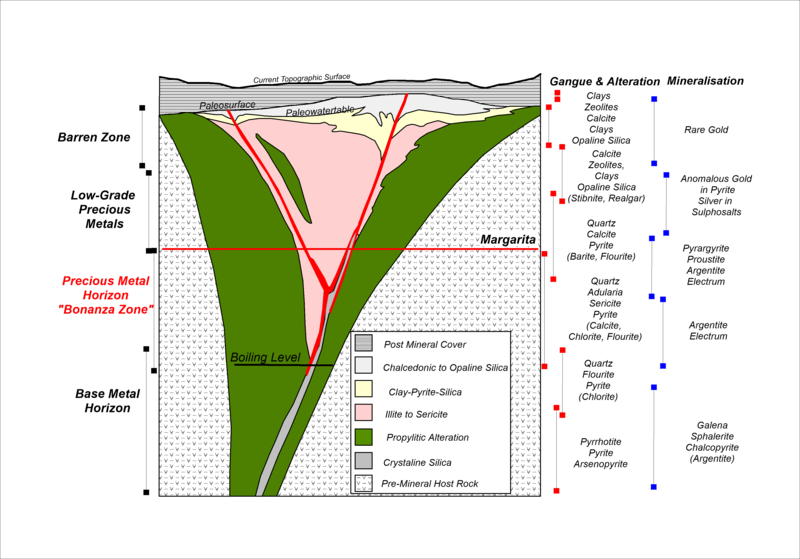 The mineralized structures consist of quartz–barite and lesser fluorite veins, stockwork and breccias with abundant manganese and iron oxides. Vein widths range from 1-5 m with an average of 1.5m and are hosted by volcanic rocks of andesitic and rhyolitic composition. The quartz in the veins is multi-stage, ranging from fine-grained to coarse grained, white, greenish; chalcedonic, sacaroidal and drusic. Sometimes the vein shows rhythmic banded quartz textures and is commonly accompanied by manganese & iron oxides. 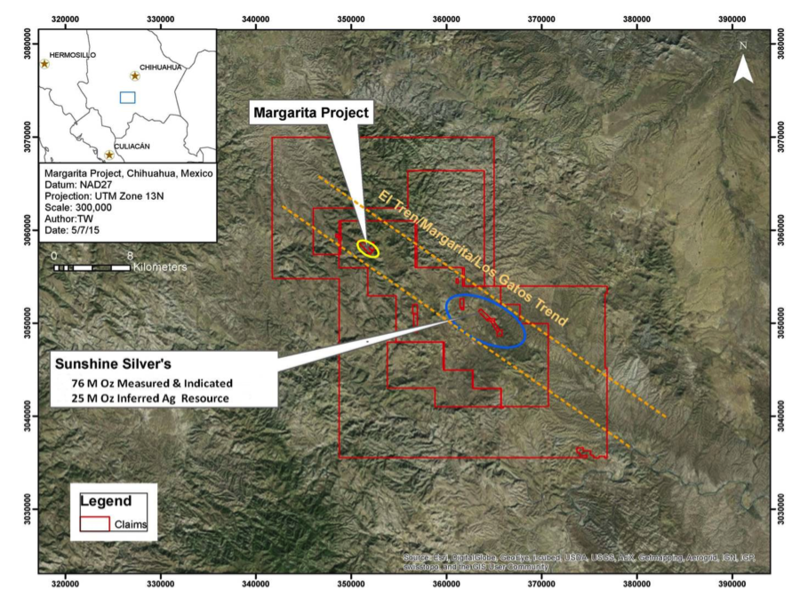 Mineralization at Margarita is characterized by silver and anomalous values of lead, zinc and gold. Quartz texture and geochemistry suggests that it is epithermal in origin and is likely of low sulphidation affinity. Sable has conducted preliminary channel sampling at Margarita to define suitable locations for drill targets. Of the 44 samples taken nearly 3/4 (29) were in the range of 100g/t to 900g/t. The presence of chalcedonic silica with these samples indicates the current surface level is above the epithermal bonanza zone suggesting these grades should increase with once the Bonanza zone is encountered. Sable is currently engaged in gaining the necessary drill permits to test these significant anomalies at depth towards the end of Q1, 2018. 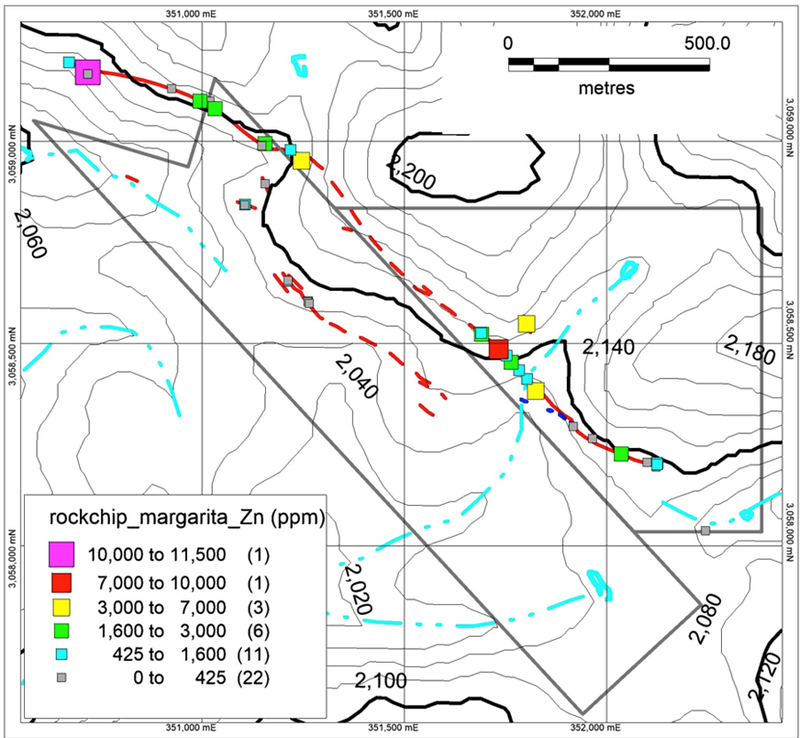 Based on the encouraging results obtained during the mapping and rock-chip sampling program carried out at Margarita project, a drill program consisting of 4,025m in 11 holes is proposed to explore for economic mineralization and test the Margarita-El Tren and El Caido veins at depths of 200-400m below surface. This proposed drill program includes 6 priority 1 holes for a total of 1,780m and 5 priority 2 holes for a total of 2,245m. Sable expects permitting to be acquired by the end of Q1, 2018.